The meeting stresses the importance to thoroughly implement the important statements of General Secretary Xi Jinping on building our nation into a strong internet power, advance the cyber security and information services in the ecological and environmental sector towards better and faster development, and provide strong support for putting up a good fight over pollution and moving forward with the ecological and environmental protection cause. This year’s 1st plenary session of the MEE Leading Group for Cyberspace Affairs was held on Mar. 14. Secretary of Leading Party Members’ Group and Minister Li Ganjie presided over the meeting and delivered remarks. He stressed the importance to thoroughly implement the important statements of General Secretary Xi Jinping on building our nation into a strong internet power, advance the cyber security and information services in the ecological and environmental sector towards better and faster development, and provide strong support for putting up a good fight over pollution and moving forward with the ecological and environmental protection cause. The meeting heard the progress report of the Ministry’s cyber security and information services as well as the key points of this regard in 2019. The meeting also viewed the presentations on the Ministry’s comprehensive portal for regulated areas, the website clusters, the “internet+government service” platform, and the ecological and environmental information on “One Map”. The meeting noted that the CPC Central Committee and the State Council have highly valued the cyber security and information services, and introduced a myriad of major decisions and measures, as a result of which historical achievements have been made in this respect. Since 2018, the Leading Party Members’ Group have introduced and implemented some reform and innovation measures, set up the Leading Group for Cyberspace Affairs and its Office, and upgraded its Information Center so that it operates directly under the Ministry. We have made greater efforts in conducting uniform planning, development, maintenance and operation of the information systems under uniform standards, and centralizing our data, human resources, technologies, funds, and management. We have made notable progress in information services and hit four milestones, which is, integrating all in-service information systems and operating them on the Eco-cloud, establishing the website clusters across the Ministry, achieving long-distance office automation for non-confidential official documents, and providing one access to online application for all administrative review items. However, the development of information services in the ecological and environmental sector is weakly based, and there is still a considerable gap from what is needed for providing strong support for the fight over pollution. So we must quicken the pace to advance the high-quality and leap-forward development of the information services. To strengthen cyber security and information services is a specific action to act on General Secretary Xi Jinping’s important thought on building our nation into a strong cyber power, the inevitable requirement for implementing the decisions and deployments of the CPC Central Committee and the State Council, and what is inherent in improving the ecological and environmental management level, reiterated the meeting. We should study Xi’s cyber power thought, fully recognize the extreme importance of cyber security and information services, raise the sense of responsibility for further use and development of information services, improve the awareness of adopting IT-based work approach, advance the thorough integration of the internet with ecological development, and make full use of the internet and information technologies to promote the high-level development of ecological and environmental protection. The meeting required that we should work closely around providing technical support for securing a victory in the fight over pollution, serve the objectives for ecological and environmental improvement, and press ahead with the key tasks on cyber security and information services. We should strictly observe the requirements for conducting uniform planning, development, maintenance and operation of the information systems under uniform standards, and centralizing our data, human resources, technologies, funds, and management. We should carry out and consolidate the milestones we have hit in terms of information services, and implement key tasks on providing technical support for the fight over pollution, the tasks for designing the information service systems, and the tasks for the reform of relevant schemes and mechanisms. We should comply with the Cyber Security Law and the responsibility system for cyber security, foster a correct outlook, tighten security supervision, carry out specific protection measures, improve the work mechanisms, and never cross the bottom line of cyber security. We should make tremendous efforts in strengthening the cyber security and information services, pay close attention to the political progress, organization and leadership, institutional development and workforce building in this regard, and promote the information services in the ecological and environmental sector to achieve better and faster development. Madame Wu Haiying, Chief Inspector of the CCDI Inspector’s Office and Chief Supervisor of the SSC Supervisor’s Office at the MEE, and Vice Minister Zhuang Guotai presented at the meeting and delivered remarks on doing a great job in the cyber security and information services across the Ministry. 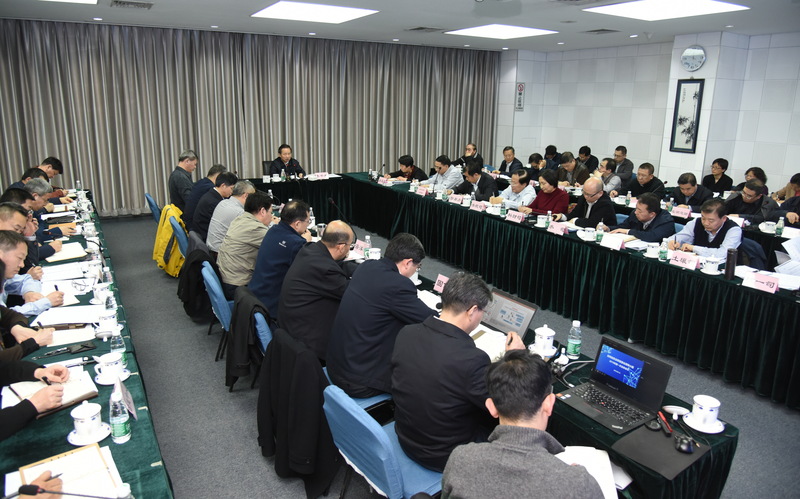 The principals of the Inspector's Office and Supervisor's Office, the Ministry's departments and some affiliates, as well as the leadership of the MEE Information Center attended the meeting.